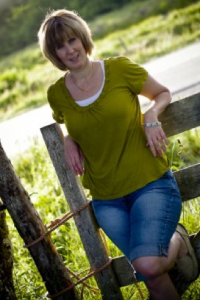 My guest today is THEA ATKINSON, author of many books, but for me specifically the VAMPIRE ADDICTIONS series because they’re the books that introduced me to Thea. Alana: Thea, welcome. Tell us something about yourself: who you are, your philosophy on life, what your day job is—you know, the little things. Thea: Ah, the little things … they tend to be so big, don’t they? Well, I’m a teacher in my day job, and my students (adults at a community college) always seem to be shocked when they discover one of my books (usually a freebie) and give it a read. They say I seem so quiet and unassuming during the day. Nothing like the person who would write such dark stuff. Grin. I had an amazing childhood: two loving parents and three brothers. I think dealing with three scrappy boys on a daily basis really defined who I am as a woman. My husband says I’ve mellowed a bit since he first met me, so I guess his influence outweighed theirs. The spitfire comes out every now and then though! Alana: Home is Nova Scotia, I believe. It conjures up images of a cold and wild Canada for me—no doubt a hangover from my reading as a child, but compounded by the fact that when I contacted you for this interview I found you out camping. Is it something you frequently do? Why do you do it? Where do you typically go and what do you get up to while you’re out there? Thea: So glad you get such a romantic image of the place! 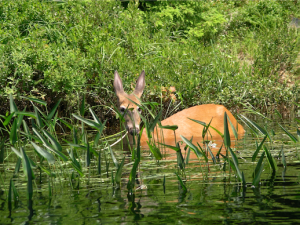 It’s every bit as wild as you think—and there are spots of such beauty you’d stop breathing for a moment. Cold is relative: we had a day this summer when it was 31 degrees. Alana: Heavens, I’ve always pictured them as cute little creatures. Are they dangerous? Thea: Oh no … but in the dead of night, a squirell is considered dangerous when a gal’s mind starts to weave a nice tale. 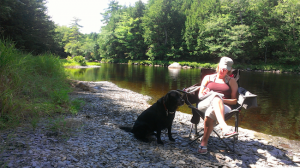 We have a bunch of friends who pop up their trailers in Keji every third week in August and we spend 10 days or so yakking, eating, swimming, kayaking, biking, and hiking … oh, and a few drinks along the way. 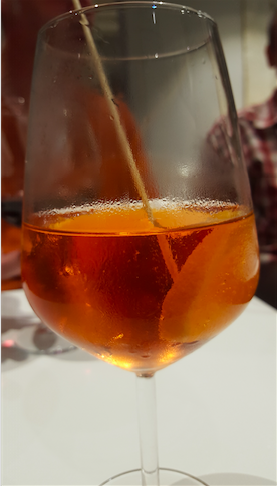 I discovered spritz in Italy this summer and I must admit to enjoying a few during our “road parties”. Alana: Italy! That’s right. I remember you saying on your blog you were there for three weeks in July. I’ve been twice now: once in 2000 with my eldest daughter, and we stayed in a 17th century building a five minute walk away from the Largo di Torre Argentina that you mention—cats by the zillion! And two years ago my husband John and I were back there for said daughter’s wedding and I discovered Prosecco. Loved that you can keep drinking it with no ill effects. Thea: Spritz is my new favorite summer time refreshment. It brings me right back to Tuscany and sitting on a lovely balcony enjoying the view of the rolling hills. 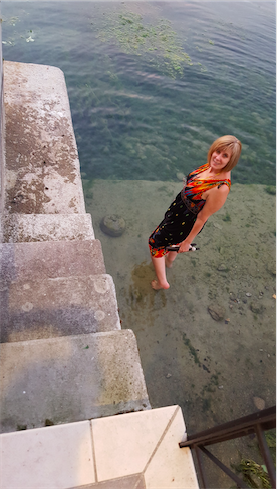 This photo is of me at Lake Iseo in Italy. Alana: Let’s talk about your books. You’ve written so many! Tell us about them. Novels? Novellas? Series? Genres? Thea: All of the above! LOL. I started out as what I hoped was a literary writer, but those books just don’t sell so I let them lanquish on Amazon. I have such an eclectic set of tastes and interests that I have a hard time sticking to one genre anyway so I mix it all up all the time—thus my brand of Fiction to the Left of Mainstream. I tried my hand at some light fantasy with hints of romance in the hopes of finding an audience. You’ll find witches and reincarnation themes, ancient Egyptians and black magic, and vampires and voodoo. I write what interests me, basically. 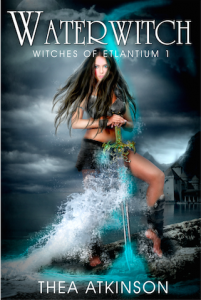 WITCHES OF ETLANTIUM was my first foray into fantasy and I based it on a character I had written for my blog streak a few years ago when I wrote a flash fiction piece for a blog every day for 30 days. The character of a witch being controlled by her megalomaniac father really intrigued me. CHASING DRAGONS was my last litfic offering, and I wrote it at a time when I was studying a bit about social justice. The character of J had so many dark spaces, I wanted him to find the light ones. 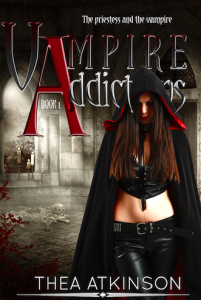 VAMPIRE ADDICTIONS was just fun. It still is. I fancy it’s more suspense and adventure than romance, but Magnus is just too mouth watering to resist adding a little steam. I love how Jade has evolved from a down-trodden, lost-her-self-esteem character into a woman who discovers her confidence was just flagging, not totally destroyed. Alana: Why fantasy? Why vampires and witches? Thea: I LOVE love love vampire stories, movies, series, and the like. I’ll watch the cheesiest story if it has a vamp in it. Same for witches … I have a few friends who have accused me of being the latter. LOL. I don’t doubt, if there’s such a thing as past lives, that I was one at some point—witch, not vampire. Alana: Yep, I knew you meant that; past life and vampire being a contradiction in terms. As well as being prolific you’re also generous. You give away samples of your work on your website. What’s the reason behind that? 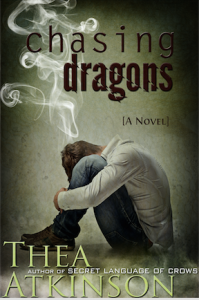 Thea: Purely in the hopes folks will enjoy them and keep reading. I’m no Alice Munro or Stephen King, so it takes a few freebies to interest folks in a nobody like me. Alana: I understand you occasionally lecture on writing. How did you get into that and why do you do it? Thea: Teacher by vocation and writer by heart. The match just seemed right. I wish I were articulate enough to say there was more to it. I have a feeling the reason has a lot to do with why I love both of those careers in the first place. Alana: What are you working on at the moment? Thea: Two things, actually. The next novella in my WITCHES OF ETLANTIUM series and book 3 in VAMPIRE ADDICTIONS. Alana: I’m looking forward to that one. I’ve become very fond of Jade and want to know where she’s heading. Thea: … and when I get stumped on one, I switch to the other. It keeps me moving ever forward. Alana: Well, I wish you ever-productive days. Thea, thank you, it’s been lovely talking to you. Thea: You’re too kind to say so, but the thanks is all mine. I’ve really appreciated having the chance to meet with you. Your questions were phenomenal and made me dig. I hope I gave you enough to work with; I’m the kind of gal who listens to someone else being interviewed and thinks: Now why didn’t *I* say something cool like that? Alana: You were pretty cool today.